Sitting in the center of the Jacobs neighborhood just west of Churchill Downs is a beautiful old school building designed in the Art Deco style. The Charles D. Jacob Elementary School, 3670 Wheeler Avenue, is actually two structures, an older Mission style structure built in 1912 and the new Deco addition circa 1932 sited next door. But since 1991 when Jefferson County Public Schools relocated Jacob Elementary to a new, certainly less distinctive structure, the old schoolhouse’s future has been uncertain. Since it was auctioned in 2006, it’s been has been vacant, deteriorating, and attracting vandals. In 2014, developers surfaced to restore the structure. A team led by St. Louis–based Bywater Development Group had proposed to convert the building into affordable senior apartments. “The proposed development will provide affordable rents to prospective residents within the market area at proposed rents [that] are well below the adjusted market rent, based on a survey of existing market rate developments,” a 2015 Jacobs neighborhood plan reads. 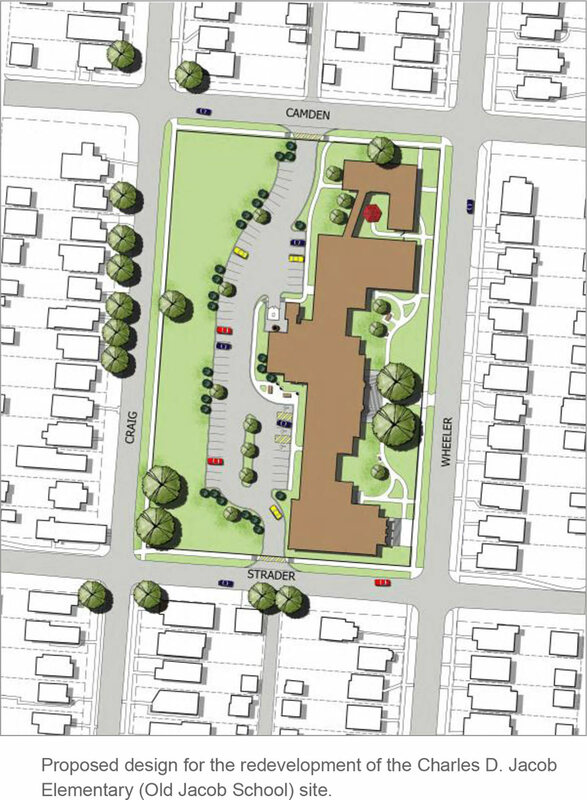 Project site plan from a 2015 Jacobs neighborhood plan. The historic rehabilitation would create 56 apartments for people aged 55 years or older, along with common areas, activity spaces, and a library/computer lab. An elevator would be installed and steps at the building entrance would be removed to bring the structure up to ADA standards. According to a 2014 Courier-Journal report, the school’s classrooms would be converted to studios, and one- and two-bedroom apartments. The gym would be two-story lofts. At the time, rents were projected to range from $395 to $560 per month. Metro Louisville considers the $11.5 million conversion a priority project, according to that neighborhood plan, and has issued $1.2 million in Metro HOME dollars toward the project. The development is also seeking state tax credits and federal historic tax credits. Community Development Block Grants are also funding site improvement. But since those plans were announced, little has happened. In 2014, the site was rezoned from R5 single family to R7 multi-family to make to project viable. The site was added to the National Register of Historic Places in 2012. Last month, WDRB’s Gil Corsey looked into the project and teased that additional funding was in the works. “We’ve heard that there will be good forthcoming from the Kentucky Housing Corporation, which will be the award of tax credits toward this project,” Mary Ellen Wiederwohl, chief of Louisville Forward, told Corsey. It appears that funding has now come through. Today at 2:30p.m., Mayor Greg Fischer and area Councilwoman Marianne Butler will gather at the corner of Wheeler and Camden avenues to announce the project is moving forward. And rejuvenation of the Jacobs neighborhood couldn’t come sooner. As Corsey reported, there have been four murders in the area in the first four months this year. Seeing a neighborhood eyesore renovated and restored could be just the boost of confidence that Jacobs needs. $205k per unit!! I see why this project has taken years to come together. Does anyone have photos of the Inside of the Old Jacob BEFORE it closed in 1991?